How to make Kerala special potti curry? Have you heard of potti curry? Probably not, if you are not from the Kottayam or Ernakulam district in Kerala. This curry is usually available only in these places. Its an authentic and tasty Kerala dish, but its not popular one probably because of the offensive smell of uncleaned potti. Oh, I forgot to tell you what potti is. Potti is cleaned intestine of goat / buffalo. The method is similar to the usual beef curry preparation and you can easily make it at home. Clean the potti / goat intestine thoroughly in hot water multiple times (Minimum 7-8 times) and then in tap water for another 5 times. Slice it into small pieces of 1.5″ x 1″ sizes. Pressure cook these pieces along with turmeric powder, chilly powder, black pepper powder, coriander powder, salt and water for up to 8-10 whistles. In a pan add the oil, garlic, ginger, curry leaves, onion, shallots, coconut pieces and saute it till the onions become brownish. Add the cooked potti along with the remaining water in the cooker to the pan. Add the garam masala and cover the lid. Cook for another 10- 15 minutes in medium flame. Stir it well, transfer to a servng bowl and serve hot with Appam, Rice, Idiyappam etc. Clean the potti thoroughly because it has a very offensive smell. Add the black pepper powder according to your spice level. Potti curry can be served for cocktail parties too.. 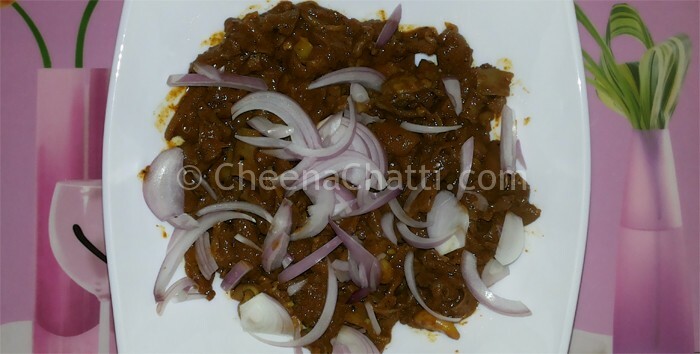 This entry was added on June 9th, 2013 by Renoos in Non Veg and tagged with potti curry, how to make potti, potty curry, kerala curry, kerala potti curry, tasty potti curry, potti recipes. Last revised on March 29th, 2018. @Sajith: thanks for the information. Never knew this. You sure that it is called potti? It must be boti !